Blue-branching seaweed growing amongst kelp and red corralline algae. Photo by Bea Proudfoot. 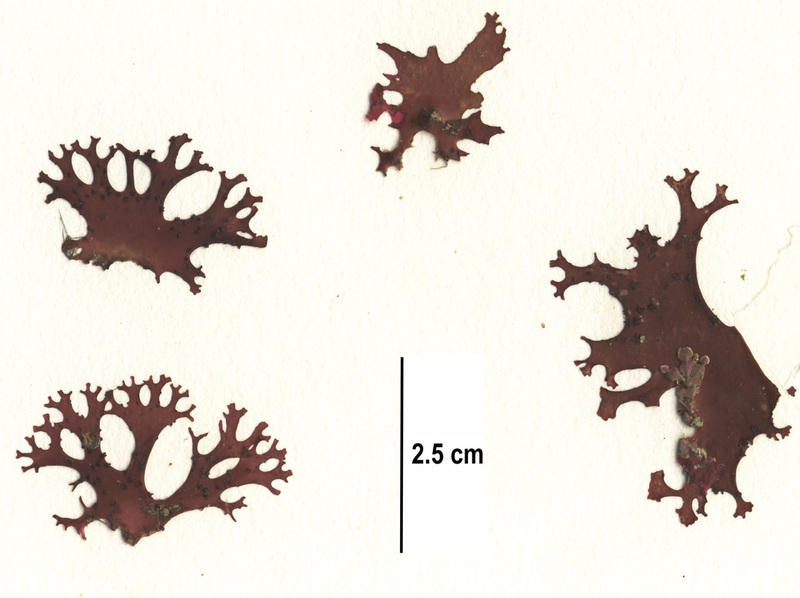 This fan-shaped red alga is dark red with a beautiful bluish-purple or yellowish-green iridescence. Multiple fan-shaped blades arise from a small disc-shaped holdfast. The blades, growing to 12 cm tall and 15 cm across, are firm, slippery, and dichotomously branched. Blades that are gametophytes bear small black dots (cystocarps). 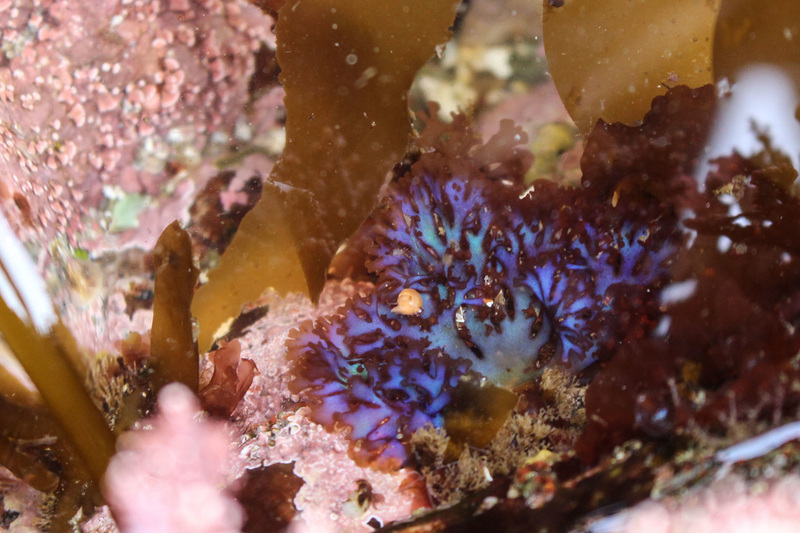 Blue branching seaweed grows from very low in the intertidal to a depth of 10 m. It is often found growing on tube worms. Its range extends from central Alaska to Baja California, Mexico. The gametophyte of margined blue branching seaweed (Gloiocladia fryeana) bears cystocarps on blade margins. Light reflecting off gland cells found in the surface layer of cells results in this species' distinctive iridescent colours. Images courtesy of Sandra Lindstrom. 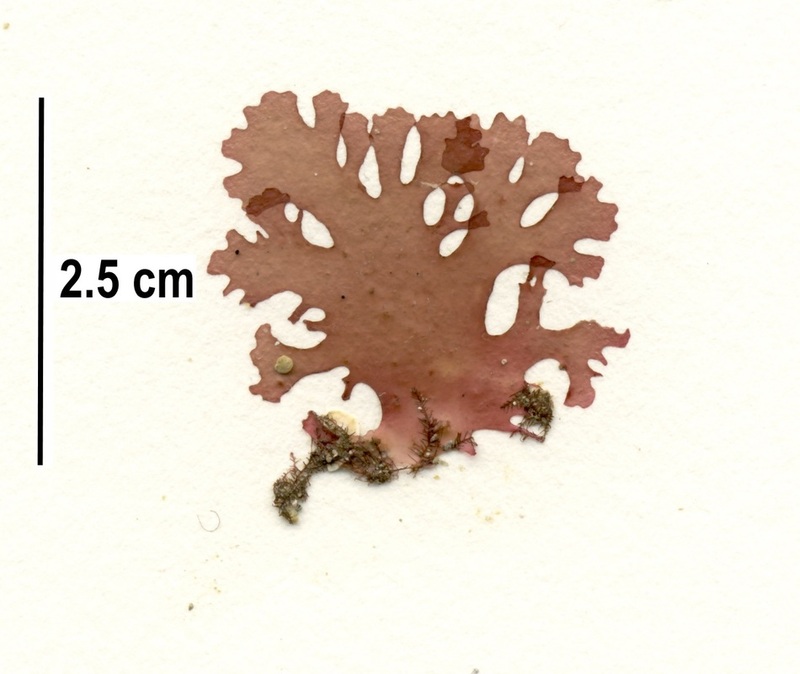 Collection numbers PTM 409 (left) and SCL 15286 in the UBC Herbarium Algae Database; search the specimen in the database for more information, or search the species for more occurrences. O'Clair, R. and Lindstrom, S. Gloiocladia laciniata (J. Agardh) Sanchez & Rodriguez-Prieto. In Klinkenberg, Brian. (Ed.). E-Flora BC: Electronic Atlas of the Plants of British Columbia. Lab for Advanced Spatial Analysis, Department of Geography, University of British Columbia, Vancouver. Accessed 20/04/2015.